Following on from last week’s 1903 breakdown we have one in 1926. It’s all too easy to think that the car in question is the Rolls Royce Silver Ghost [?] outside the Sutherland Arms Hotel in Lairg, but of course it isn’t. 27 August 1926, Lairg, Scotland. Now undergoing repairs. Have been along the N W coast. Very grand [?] and wet. This is 44 miles from the last town! Write to York. Reached the thousand today. What could that mean? Maybe a thousand miles? Quite likely as he’s heading to York, which, while in the north of England, is over 400 miles south of Lairg so he’s covering some miles. 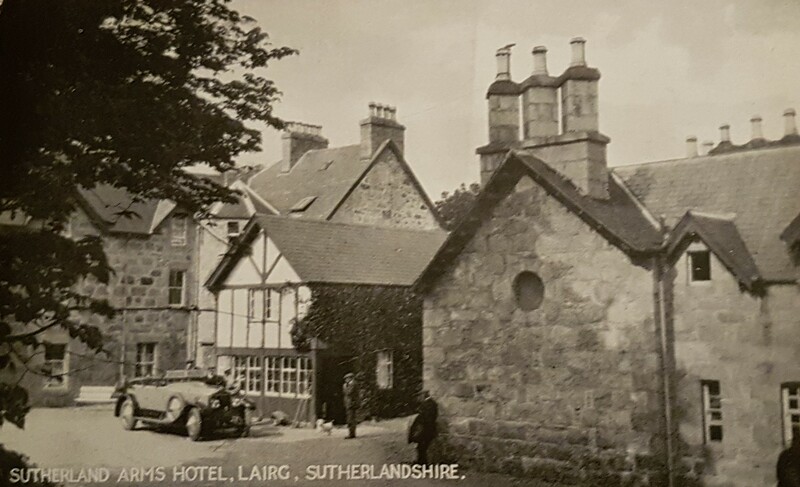 The Sutherland Arms Hotel had stood in Lairg (The Crossroads of the North) for over two hundred years but has now been demolished. Shame really. I bet that Roller is still going strong. The photograph was taken in what probably was its heyday, though even up until the 1970s it was a world class hotel appealing to those who wanted to fish Loch Shin. Then it was described as having “25 bedrooms, all with private bath, colour TV, direct dial telephone, and tea and coffee making facilities”. Many famous political figures stayed there, including Margaret Thatcher. However before her, John Profumo stayed the night and when I read this it reminded me of the following police photograph published online by the Daily Mail which I came across recently. We’re jumping about a bit, but there is a connection (vaguely). No luxury cars here but two very interesting small economical ones – A split-screen Morris Minor convertible and a Croydon-built Trojan bubble car with its sunroof open. The connection is that they are parked outside Stephen Ward’s mews home in London in 1963. Stephen Ward was the ‘society osteopath’, for want of a better description, who was friends with both the Russian military attaché and with the MP John Prufumo, who had stayed in the Sutherland Arms Hotel. Stephen Ward had introduced both men to Christine Keeler and in this mews flat, behind a two way mirror, the lovely Christine met both men (on different occasions) and the Profumo Affair scandalized Britain. I doubt any of them arrived in these cars.